Onions are amongst the most difficult vegetables to cut, as you have to run around to find tissues to wipe your tears. That is why onion choppers are a must-have in your kitchen. They are not only very effective in cutting ingredients precisely as you want but also help save time. Also, since onions are one of the most common ingredients in dishes, onion chopper makes a smart investment. Most onion choppers contain the vapors in the attached storage container. You can also use most onion choppers to chop other common vegetables like potatoes and carrots. However, once you start searching for one, you might be overwhelmed with the high number of brands and models available in the market. Thus, we have reviewed a famous manual onion chopper made by Mueller Austria with the aim to find all the reasons why it may or may not be a good option to add to your kitchen counter. Mueller Austria is a popular brand based in Europe that is known for its exclusive and high-quality range of kitchenware products. From juicers to cookers, and from coffee makers to vegetable choppers, you can find anything you may wish for in the kitchen. When not in use, you can keep the top lid closed that makes it safe for kids as the blades will be covered. This also makes it safe to use as your hands remain at a distance from the blades since all you have to do is to press the plastic lid using the handle. Available in grey color and transparent container, it weighs only 1.6 pounds which makes it extremely easy to carry around. The dimensions are 10.6 x 4.7 x 3.8 inches. Upon purchase, you will receive a package that comes with several components including a container, Mueller Austria recipe e-book, a cleaning brush, two stainless steel discs, and dicers. The two dicers feature different sized squares which include 6.88mm dicer and 13.6mm dicer. For those who are tired of cutting, dicing, and chopping onions and are looking for ways to make the process simpler and quicker, the Mueller Austria Onion Chopper Pro might just be the answer to your problems. With a capacity of four cups, you can use this product to chop onions in one go to use for the next few days. The container also contains the onion vapors that can significantly reduce the production of tears. The manual chopper comes with two ultra-sharp blades, which makes the process effortless. No matter how hard the vegetable is, just put it on the blades and press the chopper handle, and it will cut through in one go and minimal force on your part. You can also use it to chop, slice, and dice vegetables and fruits but you cannot make a vegetable paste. Additionally, even if the blade is ultra-sharp, you won’t be able to use it on nuts. Definitely, you can find a lot of good options when it comes to manual onion or vegetable choppers from some of the top kitchenware brands. That said, in order to see if the Mueller Austria Onion Chopper Pro is a worthy investment, we will compare it with a somewhat similar product, which is the Vidalia Chop Wizard. Both come with two sharp stainless steel insert discs that can easily cut through hard vegetables and fruits. They also both have a similar structure and design—they have a moving lid and a container. Hence, for both, all you need to do to cut vegetables is to press the lid downwards. The discs dice sizes are also similar as one disc is used for smaller 1/8″ square pieces while the other for larger 1/4″ square pieces. Both are also very easy to clean and come with a cleaning brush. They are also both made of BPA-free material and approved by FDA that makes them perfectly safe to use. 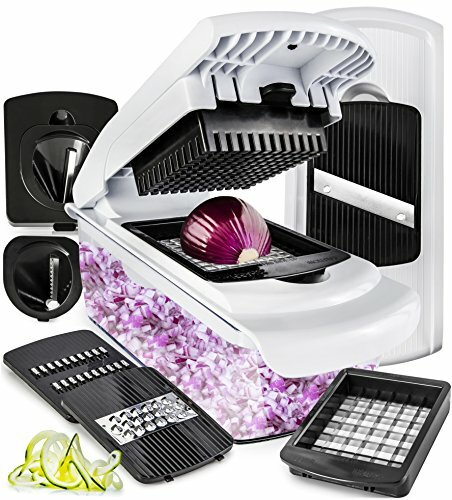 The first difference is that Mueller Austria Onion Chopper Pro is explicitly designed for onions, but you can use it with other similar vegetables and fruits as well. 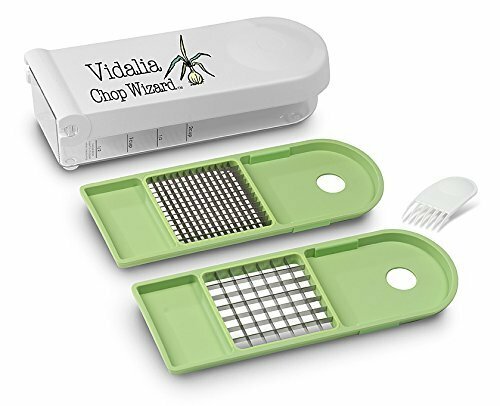 On the contrary, the Vidalia Chop Wizard has been specifically made for multi-purpose use. Another difference is the capacity of the container. 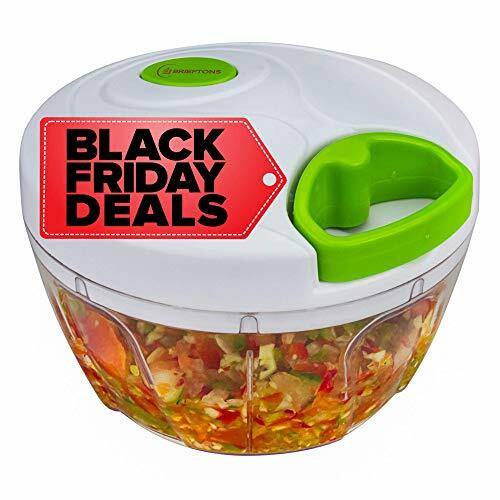 The Mueller Austria Onion Chopper Pro allows you to chop and store four cups of vegetables, while the Vidalia Chop Wizard will enable you to cut only two cups of vegetables at a time. However, the smaller size makes it lighter and easier to store. What do you use to slice meat? Most probably a knife, right? However, knives are not the best tool to cut meat slices to perfection. There is a better, quicker, and easier-to-use tool that can certainly make your kitchen less messy—the meat slicer. Manual slicing with knives is always tricky, and if you are new to it, it is often risky as well. Meat slicers offer you a much better way to cut through thin or thick slices of meat or other foods with accuracy. The process is also less tiring and less time-consuming, which makes it a much more desirable option over knives. In fact, if you host a lot of guests regularly, you will realize that a meat slicer is a must-have item to keep in your kitchen because it will help save both time and effort when it comes to food preparation. However, choosing between a lot of options out there is often a tricky task. You may end up with a product that may mismatch your needs or doesn’t perform like you wanted it to work. In this article, we have reviewed a well-recognized and multi-purpose product, the SUPER DEAL Premium Electric Meat Slicer and written down all the reasons why it can be a good addition to your kitchen counter. SUPER DEAL is not as popular as some other kitchenware brands. This is because it is new in the market. However, it has already produced some top-quality products for both commercial and home use, and their Premium Electric Meat Slicer is one of them. The Premium Electric Slicer is a well-received kitchen equipment for all the right reasons. With an eye-catching, compact design and silver finish, it would also surely add aesthetic value to your kitchen counter. This electric meat slicer comes with a seven-and-a-half-inch stainless blade that cuts through even thick meat pieces with precision. In fact, it is considered a multi-purpose meat slicer that acts more like a food slicer as it can be used to cut vegetables, fruits, or any other food. Also, the slicer allows you to choose the size of your slice. You can choose between 1/32-inch thin to ⅗-inch thick slices. It also offers the maximum cutting length of a seven-inch slice. How does it do this? It uses a powerful 150W motor that is equipped with a noiseless belt in order to cut consistent, precise, and accurate slices. Now, when you buy a meat slicer, you also need to look into safety it offers. In that case, the SUPER DEAL Premium Electric Meat Slicer has got you covered. It is perfectly safe as it comes with suction grip feet that don’t let it slip even on a slippery surface. It also includes plastic meat pusher to keep your hands safe. This electric meat slicer is also very easy to assemble as you can remove parts to clean. You can easily remove the meat-grip arm, carriage system, and slide rod-extension for hassle-free maintenance. It also uses a removable ring-guard cover that keeps it safe from dust and debris. Even though the body is made of industrial-grade aluminum, some parts are also made of plastic to keep it lightweight. In fact, it is one of the most lightweight meat slicers out there as the weight is only 10 pounds, while the overall dimensions are 13.8 by 10.6 by 11 inches. The SUPER DEAL Premium Electric Meat Slicer is an ideal choice for those who are looking for a multi-purpose, affordable, and lightweight meat slicer for their kitchen. This easy-to-maintain meat slicer allows you to cut almost all food items you can think of. Aside from that, this meat slicer also allows you to easily switch between different slice sizes and thickness, which adds to its versatility. Its biggest strength is its ease of use. Even when it is one of the most affordable options out there, it is durable enough to remain on your kitchen counter for years to come. Not sure about the SUPER DEAL Premium Electric Meat Slicer yet? If we compare it to a similar product, such as the Kitchener MS-106215R Meat Slicer, we can find some similarities and differences as well. To begin with, both are affordable, but the one from SUPER DEAL is a bit cheaper even though they have almost similar features. One major difference is that it uses a 7.5-inch blade, which is smaller than that of Kitchener’s nine-inch blade. When it comes to strength of blades, both are made of high-quality stainless steel. Both are also multi-purpose in that they can be used to cut through a variety of foods like meat, fruits, vegetables, and cheese. Both meat slicers are easy to clean and maintain as you can remove and reassemble parts in minutes. However, the design of the SUPER DEAL is slightly better when it comes to ease of use. The design is also compact for both meat slicers, while both are made of similar cast aluminum. The motor power is also 150W. However, some parts of the Super Deal Meat Slicer are made of plastic, which makes it lightweight as it weighs only 10 pounds while Kitchener weighs 14 pounds. The two meat slicers feature suction grip feet to remain in place while in use. Overall, both are almost same, but SUPER DEAL has the upper hand due to its lower price, ease of use, and light weight. The motor power is same, but the blade is slightly bigger in Kitchener Food Slicer. The SUPER DEAL Premium Electric Meat Slicer is, without a doubt, one of the best slicers among similar products within the same price bracket. It is a multi-purpose slicer that achieves much more than just cutting slices. The powerful motor is good enough to cut through thick meat pieces with precision and consistency. Overall, it is an affordable, portable, compact meat slicer with almost similar features that you can find in more expensive meat slicers. All in all, there is no reason not to try this product if you want to add more efficiency to your food preparation tasks. Cutting meat at home can be a real hassle if you don’t have the right tools, but with a good meat slicer, you can make the entire process quick and hassle-free. Those who see a lot of guests, or have larger families, can find great relief in the form of the best meat slicer. Simply put, cutting through meat was never that easy before the meat slicer. This is exactly why it is getting more and more popular among users. If you are planning to buy one, you can find hundreds of different models and types that may be confusing for you. In addition, you also need to look at a lot of factors before deciding which one is the best. Beyond price, you need to compare their effectiveness, blade size, whether they are easy to clean, how easy they are to maintain, their safety features, and several other factors. To make it easier for our readers, we have listed the three top options out there based on the above-mentioned factors. Let us examine each one in order to determine which is the best meat slicer. The first on our list is from Chef’s Choice, a U.S.-based company that is known for its high-quality knife sharpeners, food slicers, and other kitchen appliances. Do you think its features are enough to match your kitchen needs? Let’s find out! The 609000 Electric Slicer is a multi-purpose slicer that comes with a high-quality stainless steel blade and a high torque motor. Even though the blade is made of stainless steel and the body is made of cast aluminum, which adds to its durability, some parts are made of plastic to keep its weight to the minimum. The design is very handy, portable, and easy to grip while it weighs only 8.5 pounds, which makes it a very lightweight option compared to other meat slicers. It has a compact body with dimensions: 15.5 by 10.5 by 11 inches. This makes it a good option for home use. You don’t want a large meat slicer occupying your counter space, do you? Unlike other meat slicers, this model consumes less energy as it uses a 100-watt motor. You can use it to cut meat and also other foods such as vegetables, fruits, and cheese. You can also easily remove its part for 100% cleaning. Beswood is a well-known Australian brand that is recognized all over the world for its high-end kitchenware. The Beswood Meat and Food Slicer is one of their most popular products, and for all the right reasons. This meat and food slicer is a chromium-plated, carbon steel, electric 240W meat slicer that is designed for both home and commercial use. It comes with massive 10-inch carbon steel blades that can cut through different types of meat with ease. It is a multi-purpose slicer too, which means that it can be used to cut meat or any other food without any hassle. It is also a durable product built to last long with an industrial-grade aluminum body. The best thing about this is that it is fitted with two whetstones at the top that keep the blades sharp all the time. Moreover, this meat and food slicer also meets all U.S. quality standards including FDA, NSF, and ETL, which ensures that it is safe to use. It also uses a high-quality V-belt that keeps the noise and vibration to the minimum. In addition, to add an extra layer of protection against power shock, it features a double-illuminated On/Off 24V switch too. The product also features a blade ring guard and skidproof rubber to keep it steady when in use. The product dimensions are 18.8 by 16 by 14 inches. The last on our list is from Kitchener, also a well-known kitchenware brand dedicated to producing quality products. To begin with, their meat slicer is an affordable tool that boasts all the features that come with much more expensive meat slicers. This meat slicer uses a 150W motor, which is much less than that of the 240W motor used by Beswood. This means that its energy consumption is much less. The body is also made of premium quality die-cast aluminum. Nevertheless, it is still considered a multi-purpose slicer that can be used to cut through thick as well as thin foods. The nine-inch blade is made of high-quality stainless steel that provides precise cuts. It can cut deli-thin slices as well as ⅝-inch thick slices. The overall compact design also makes it easier to use, and its light weight makes it convenient to move from one place to another. It weighs only 14 pounds while the overall dimensions are 18.5 by 11.4 by 12 inches. It is also perfectly safe to use as it is approved by the FDA. Kitchener also offers one year of warranty on their products. It also comes with suction cup feet to make sure it doesn’t move on your kitchen counter when in use. This meat slicer is easy to assemble and disassemble as well, which means you can clean its food carriage, blade, food deflector, and thickness guide plate separately. Best Meat Slicer: Which One Is the Best? In the end, deciding which one is the best depends on what you are looking for. If you want a heavy-duty and easy-to-maintain meat slicer, you can choose the one from Beswood since it has larger and corrosion-free blades. Even though it is designed for restaurants and other commercial purposes, it works well for home use as well. If you are looking for a more affordable option, which also consumes less energy, then the Kitchener Professional Electric Meat Slicer and the one from Chef’s Choice are good options in their own ways. All in all, it is up to you. After all, these products are multi-purpose slicers that can be used for a variety of foods and sturdy enough to remain in your kitchen for years to come. Spiralizers originally took off from cutting vegetables to being a great alternative to pasta makers. It is commonly used by people who are following a strict diet like gluten-free and low-carb diets. Over time, more and more people realized its effectivity and efficiency in the kitchen, and manufacturers started innovating spiralizers. This machine easily creates spirals from vegetables and fruits. These spiraled vegetables, or more commonly known as “zoodles”, can be easily mixed with different ingredients and create unique masterpieces without spending hours in the kitchen. The spiralizers can also be easily cleaned by using a brush, towel, or just putting it inside a dishwasher. Spiralizers come in different sizes and choosing one depends on how and where you plan on using it. Some people only use this machine to create occasional garnishes for their salads, while others use it when preparing everyday meals for their entire family. Nevertheless, there are spiralizers for any use with their corresponding prices and quality. Aicok is a well-known manufacturer of steamers, coffee makers, juicers, bottle openers, kettles, grinders, mixers, and other kitchen appliances. They continuously invest in their product lines in order to improve it by using their years of experience and knowledge of technology. They always believe that the customers must always come first, which is why they specialize their team in marketing and developing their long list of kitchen line products. They strive to provide a healthy and comfortable way of living through their products straight to your home. One of the famous products of Aicok is their two-blade electric spiralizer. This item is very efficient and effective in producing high-quality spirals perfect for your next meal. This electric spiralizer comes with two stainless steel blades that are capable of making different slices like linguine, spaghetti, ribbons, and spirals. You can easily create vegetable salads, apple tarts, zucchini noodles, and curly fries. Aicok also added a 1.5L large and detachable prepping bowl so that you can easily mix your ingredients. This machine is equipped with a powerful 120-watt motor to give you an effortless and silent operation. With this spiralizer, you don’t have to go to your grocery stores and purchase all your ingredients, but you can already create them right from your kitchen. This lessens your cost in money as well as meal prep time. This Aicok electric spiralizer will lessen your prepping time because you don’t have to crank p any handles or put the food in place while the machine is working. Instead, you simply put the vegetable in the tube, use the 65mm chute to push the food down, turn the machine on, and it will automatically spiralize your food in less than a minute. Because of its wide tube, you can easily fit in narrow carrots or large tomatoes without having any trouble at all. Aicok made sure that the users of this electric spiralizer will not have any problems when assembling and disassembling the machine. If you’re about to use this spiralizer, make sure that you hear a clicking sound when closing the lid to ensure that it’s securely locked into place. Once you’re done, you can easily take out its cutter component by pulling it upward and drawing the lug boss using your fingers. Storing this machine is fairly easy to do if you’re not going to use it. The removable pieces can be easily fit together to give you a compact unit. Plus, all its parts (except for the blade) are dishwasher-safe, which means that you don’t have to worry about cleaning the machine in the end. The Hamilton Beach 3-in-1 Electric Spiralizer is thoughtfully designed to produce high-quality spiraled vegetables in just a matter of a minute. It is equipped with three cutting cones to ensure that you get the perfect linguine, ribbons, and spaghetti results that you like. The Hamilton manufacturing company also included a 2.5-inch large chute that will easily hold and push your food through the machine for an effortless way of producing spirals. Another great feature is the six-cup bowl wherein you can catch the spiraled results without creating any mess in your kitchen and differentiate the spirals that you created. This 3-in-1 electric spiralizer is very easy to store away, and the removable parts are dishwasher-safe for an easier and faster way of cleaning. They also included a hand brush for you to clean your blades without any hassle. The downside to this machine is that the motor can be too weak for those vegetables that are too tough to cut. Other than that, this product is very useful and can be easily used any day. Its product dimensions are 8.3 by 21 by 8.3 inches and have a total weight of 5.05 pounds. The Aicok Electric Spiralizer is very easy to use and creates high-quality spirals. It can easily cut through different fruits and vegetables through its 65mm chute without putting any effort at all. This electric spiralizer comes with a large prepping bowl for a mess-free experience and two optional blades depending on the spirals that you want to make. You can easily clean this machine using a brush and put the removable parts in a dishwasher. If you’re looking for a high-quality electric spiralizer that’s easy on the pocket and can produce great spirals, then you should definitely check out this Aicok spiralizer. Although it has its downsides, the pros definitely outweigh the cons and giving you effortless ingredients for your next meal. Are you looking for the best electric spiralizer to add to your kitchen? Let this article be your guide! This kitchen tool will not only help you achieve the physique that you want but also help you live healthier and longer. Experts say that we must have an average intake of 2.5 to 3 cups of fresh fruits and vegetables daily in order to achieve overall wellness. By doing this, you will surely have a steady supply of antioxidants, vitamins, minerals, flavonoids, fiber, and many other important metabolites. Luckily, a spiralizer can help you achieve this. A spiralizer helps you easily cut fruits and vegetables into long strips or ribbons that can resemble pasta or noodles. Spiralizing your food will improve its taste profile and add to its nutritional value. By doing this technique, you can easily mix different vegetables without worrying about the combination and tastes. Choosing the best electric spiralizer can be difficult if you don’t consider the right factors. Not sure what to look for in an electric spiralizer? Allow us to help you out. First and foremost, the machine should be able to cut your favorite veggies and fruits in the littlest amount of time. Second, it should able to keep the nutritional values from the food. And lastly, it should be easy to clean and maintained. When you’re looking for a stress-free machine, then you should definitely check out this product. What’s amazing with the Bella Electric Spiralizer is that it can easily accommodate a six-inch piece of fruit or veggie, unlike its competitors. This means that you don’t have to spend more time cleaning and cutting your products when you could have used your time doing different tasks. You can easily create veggie spaghetti, curly fries, linguini, and fettuccini. Further, it also boasts an auto-stop feature, which allows the user to simply place the desired product, turn on the switch, and let the machine do the rest. When it reaches ½-inch of the product, it will automatically stop and give you colorful spirals. Other than that, it has a snap-on bowl too, which easily holds the spiraled results for easy storage. Another great feature of this machine is the rotating four-blade technology that creates large cuts and spirals. This means that you don’t have to keep changing the blades, minimizing the likelihood of injuries at your end. This machine is safe and easy to clean because they included a hard bristle cleaning brush for the blades and the removable parts are safe to put in the dishwasher. The Bella Electric Spiralizer has a total size of 12.1 by 5.9 by 7.5 inches, and it weighs only 2.54 pounds. Gourmia is known as one of the most innovative manufacturers of small appliances that deliver high-efficiency and performance. If you’re after a top-quality product, then this machine should be on your list because it is ETL Certified, which means it’s safe, high-quality, and can be very efficient. The CurlyQ GS325 electric spiralizer features a stainless-steel, precision-milled Q-Cut Cones that can easily create decorative garnishes for your spaghetti and salads. It is equipped with three blades and a Spira-Smart technology that gives the power to do great in your kitchen. Gourmia included a nice touch to the GS325 by providing a large capacity prep bowl to easily collect your spiral meals without any mess and for an effortless preparation. The total size of this machine is 12.5 by 9.6 by 7.1 inches, and it has a weight of no more than 5.4 pounds. Finding an electric spiralizer with a grater and blender with an affordable price tag can be a challenge. Thankfully, there’s the Chefman Electric Spiralizer and Immersion Blender Combo Kit. With this machine, you can easily blend your smoothies and sauces, grate your cheese and onions, spiral your veggies for salads, and even cut down your product into beautiful ribbon shapes. The Chefman Electric Spiralizer is equipped with a 300-watt motor that can handle all your blending and spiralizing tasks for a faster finish. 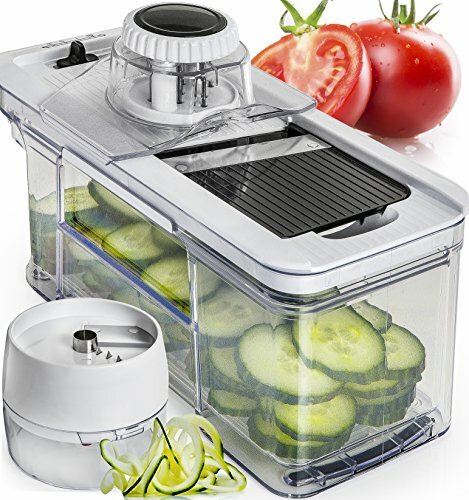 They also added three different types of blade attachments and powerful extension so that you can have the option when you’re blending or spiralizing for your next meal. It has an easy-to-grip handle along with a two-speed push-button control for your convenience and better spiralizing style. Chefman created this machine with an open bottom so that you can easily push the finished products away from the machine to avoid getting it full and continue with your task. The removable parts can be easily cleaned by putting it in a dishwasher, and you can easily wipe down the handle to clean it. 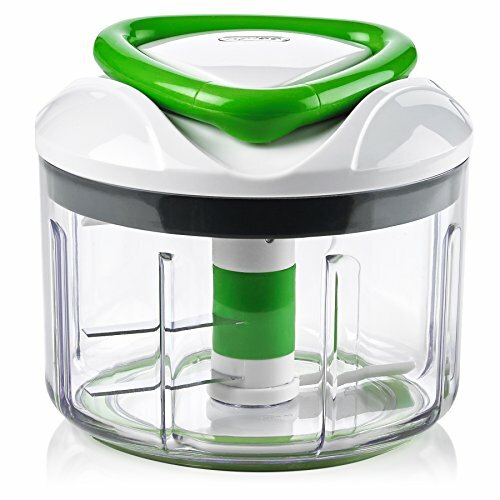 The total size of this electric spiralizer is 15.5 by 9.5 by 6 inches and weighs a total of 3.92 pounds. Looking for the perfect electric spiralizer can be a daunting task, especially if you have little to no idea about the features that need to be in the product. Among the ones we have reviewed, we choose the Bella 4-in-1 Electric Spiralizer as our best pick because it has all the right features that you should expect from a quality spiralizer. You can get the perfect cut for your fruits and vegetables, thanks to its four-blade technology and auto-stop feature. No need to worry about constantly holding your product too, because its lock and switch feature can help with that. Moreover, you can also say goodbye to a messy kitchen because of its snap-on bowl that catches all your finished products. To top it all off, this spiralizer is also very easy to clean. You just need a brush to remove all the fruit and veggie bits. The removable parts, on the other hand, are all dishwasher-friendly. Electric meat slicers are heaven-sent equipment for busy delis and even a busy home kitchen with more than one mouth to feed. 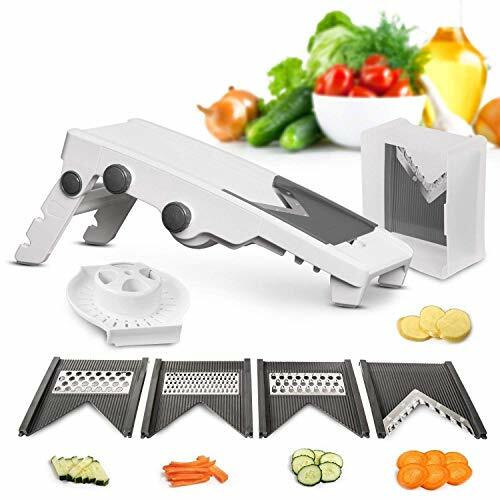 These meat slicers not only slice meat thinly for you but they can also cut through firm vegetables and hard cheeses, all with the same thickness if you so desire. The consistent thickness has a high aesthetic appeal as it brings the illusion of being assembled just to be served. Food also looks more enticing and appetizing when you noticed that everything is served and cut properly, to the thickness that you want. Imagine having to bite through an uneven portion of ham or bacon. The chewing alone can give your teeth nightmares! The F2C Meat Slicer comes equipped with a powerful 110v, 240 w 1/3 horsepower motor that has a rotary speed of 530 rpm. This is powerful enough to cut through any thickness of meat and hard cheese again and again, even for a long period. The 10-inch blade of this meat slicer is made of durable stainless steel which is also food-grade and corrosion-proof. This blade can finely cut any number of various food items and remains sharp no matter what. Two whetstones are built-in with the F2C Meat Slicer, and they make honing the blade to keep it sharp easy to do. Sharpening control buttons are used to sharpen both sides of the rotating blade, just gently push them to sharpen the blades then disinfect the blade right after. This meat slicer comes with a numerical knob, which indicates the thickness to which you are cutting your meat in. This knob makes the center plate move back and forth adjusting or maintaining the slice thickness every time it passes through the blades. 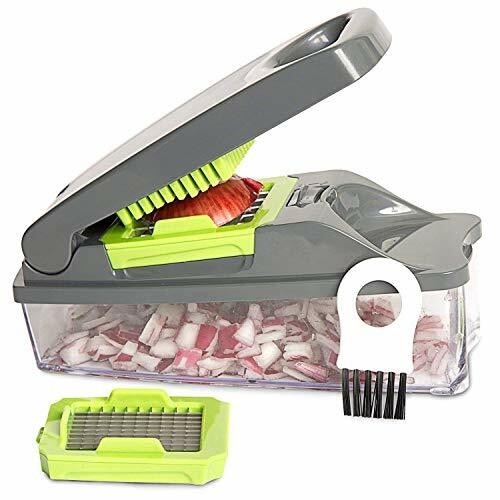 This meat slicer comes with a transparent plastic plate that collects the sliced food item on the other side of the slicer. This helps avoid food from spilling over and from being contaminated. The F2C Meat Slicer has rubber feet that keep it stable while you slice your meat with it. This feature helps in keeping the noise and vibration low while ensuring that the machine is in a flat level at all times. This slicer is on the heavy side. The F2C Professional Stainless Steel Semi-Auto Meat Slicer has a powerful 240W motor that runs quietly with the help of its rubberized feet and aluminum casing. This meat slicer can slice meat from a zero setting to 1/2-inch thick, just enough thickness to satiate your hunger for meat. The 10-inch blade is made of stainless steel, and you can maintain its sharpness using the buttons that control the two built-in whetstones. The F2C meat slicer also comes with two handles that keep it stable while you use it and output holes that help disperse heat from the electric motor. The Super Deal slicer also has sharpening controls and a transparent plastic plate for holding meat that has just been sliced. It also slices meat up to half-an-inch thick and can be as thin as a sheet of paper. Its motor runs smoothly and quietly, especially if well-kept and cleaned at a regular basis. The Super Deal Commercial Stainless Steel Semi-Auto Meat Slicer and the F2C Professional Stainless Steel Semi-Auto Meat Slicer have almost the same set of features that make it hard for us to decide which one is better. 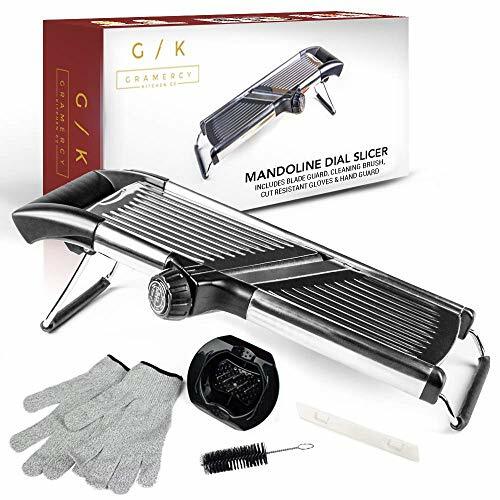 You get a powerful motor and a stainless steel blade with either of these units; you also get to have an adjustable thickness knob and built-in whetstones to keep the blades sharp. The Super Deal slicer is at a slight advantage with the ring guard attachment that protects the blade from the user and vice versa. This attachment also prevents meat from being splattered all over the place and keeps your fingers safe at all times. The difference that gives the F2C the win though is its fast cleaning process. The F2C meat slicer has easy to disassemble parts and components which make it as easy to clean and reassemble. The F2C slicer is also a little lighter than the Super Deal one which makes it a little easier to store and transport. The knobs and other attachment of the Super Deal slicer can also be a tad smaller which makes handling the unit more difficult and with less control. The instruction manuals of both the F2C slicer and the Super Deal slicer can be hard to understand and decipher, but the F2C manual has easy to understand pictures which is another advantage that it has over the Super Deal slicer. Semi-automatic meat slicers are designed for a mix of home and commercial use, which means they can continuously run as needed or be stored and used at any point in time. They also have more powerful motors than smaller units, which make them heavier but they also come with features not commonly found in home units. Whatever the use, meat slicers are slowly making its way to the heart of any meat lover and have already found several non-deli uses, from slicing roast beef and brisket to slicing blocks of cheese, and even bread. Make sure to maintain your meat slicer in a tip-top condition by cleaning it after every use, disinfecting it regularly and by conducting maintenance checks at least once a month.